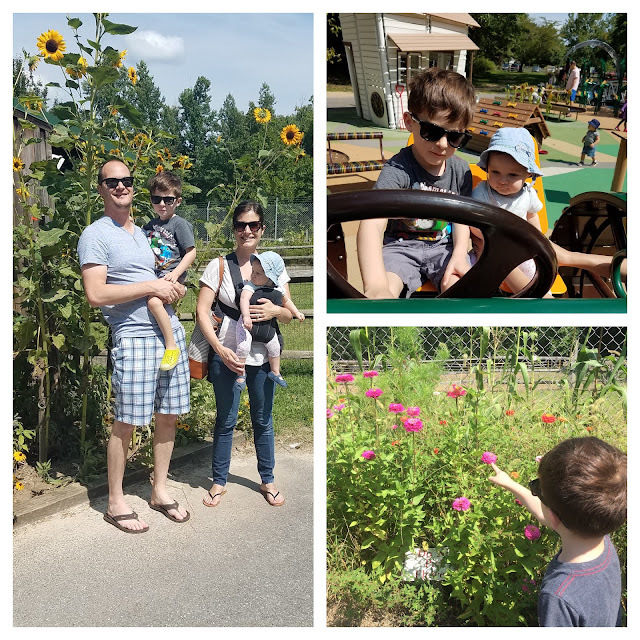 This past week, the kids and I headed west, without our beloved Dad/Scott who couldn't get away from work, to spend some quality time with family and a few friends. I was TERRIFIED (as in middle of the night wakings and anxiety) of flying solo (literally and figuratively) with these kids. The last time we visitedm Josephine was a darling little blob, and now she's crawling fast, pulling up, and cruising on furniture. I knew Henry would be fine on the flight because, well, screen time. He's engrossed in any movies or shows available. When I booked the flight, the ticketing agent booked us for aisle and window seats and indicated a lap infant would be there, potentially allowing for a person to be turned off by purchasing the middle seat. In the weeks leading up to our trip, I checked and watched as both seats were purchased and womaned up on how this was only going to be 10.5 hours of my entire life and we would be fine. And, spoiler alert, we were. We lucked out on the flight over with the NICEST woman who offered to hold Josephine so I could make bathroom trips with her brother and just because she wanted to hold a baby. It was awesome. 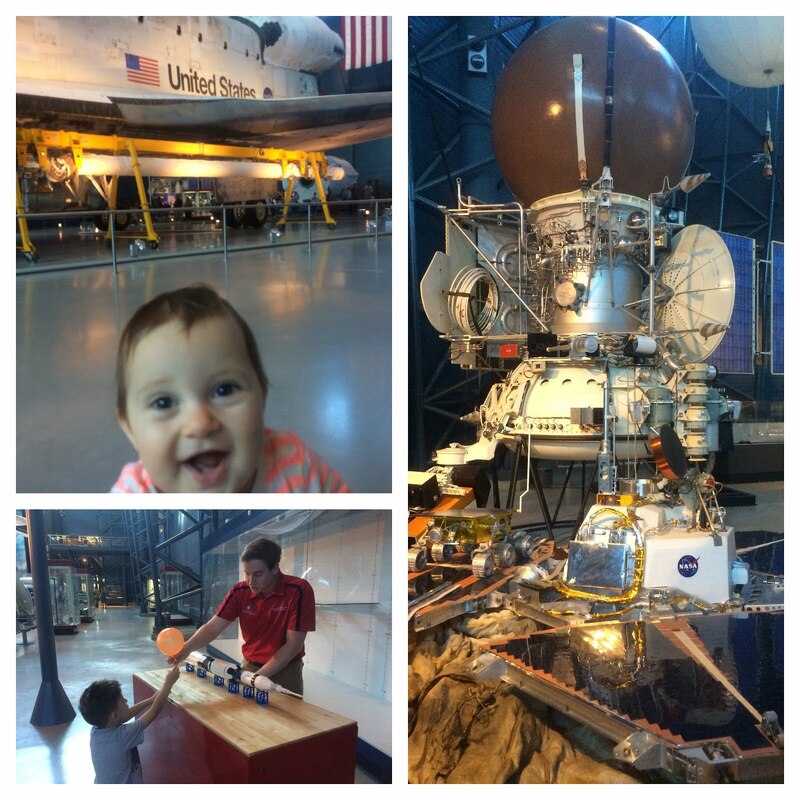 Both kids were remarkably great, and despite maybe two uncomfortable cries out of Jo and some descent pressure problems with Henry, we made it one pieces without any meltdowns or major issues on the flight. I felt more confident with our leg home having the first under our belt and because you shave off about 30 minutes heading east (thank you jet stream). When the captain announced everyone was on board and the middle seat was empty (thank you, ticketing agent!) my spirits lifted even more. We might as well been flying first class with that space, and when the food and beverage cart came by I even indulged in a prosecco split since I could keep it out of Jo's reach. The cherry on top was when the flight attendant told me it was on him. Um, thanks Alaska Airlines, you are AWESOME! Seriously, it's the little things in life. Our time with family and friends in California was really special. I wish we could have stayed longer, seen more people of course, but we certainly crammed in quality over quantity. Henry especially soaked up the time with his Grandmas and Grandpas, complete with chocolate donuts, dart guns, and an early birthday cake celebration, while Josephine enjoyed the lavished attention, hugs, throws, and swings herself. Henry really loves a good game of smash ball (and by game, I mean a three-return-rally) and particularly loves playing with my Dad. 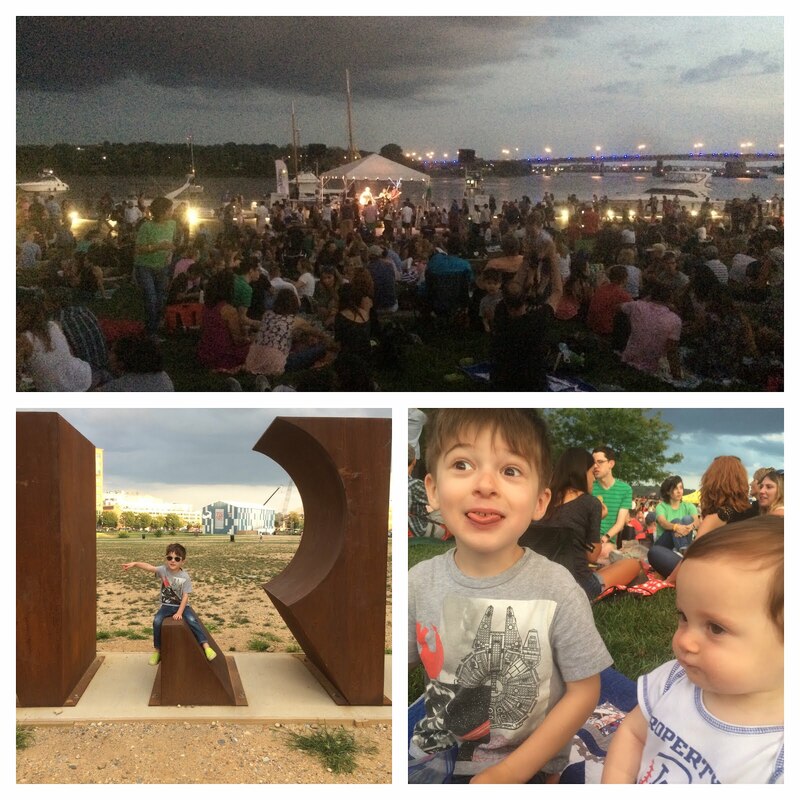 We were even lucky enough to have time with our amazing Fullerton friends, and despite the time apart, the kids were thick as thieves and played so well together. Obviously a beach day was necessary and the Cratons are partial to Corona del Mar. Henry dug for sand crabs, Josephine played and ate the sand, and Henry asked to be buried in it. We even brought some home to do a volcano project on the patio. Short of making concrete, I think we did everything one could with sand. I even was treated to time with my best friend forever and her two darling girls for lunch, cookies, and carousel rides at South Coast Plaza. Before the sun set on the trip, I reunited with my former coworkers from my first job, where the number of kids has overtaken the number of employees! Until next time, California, we love you! 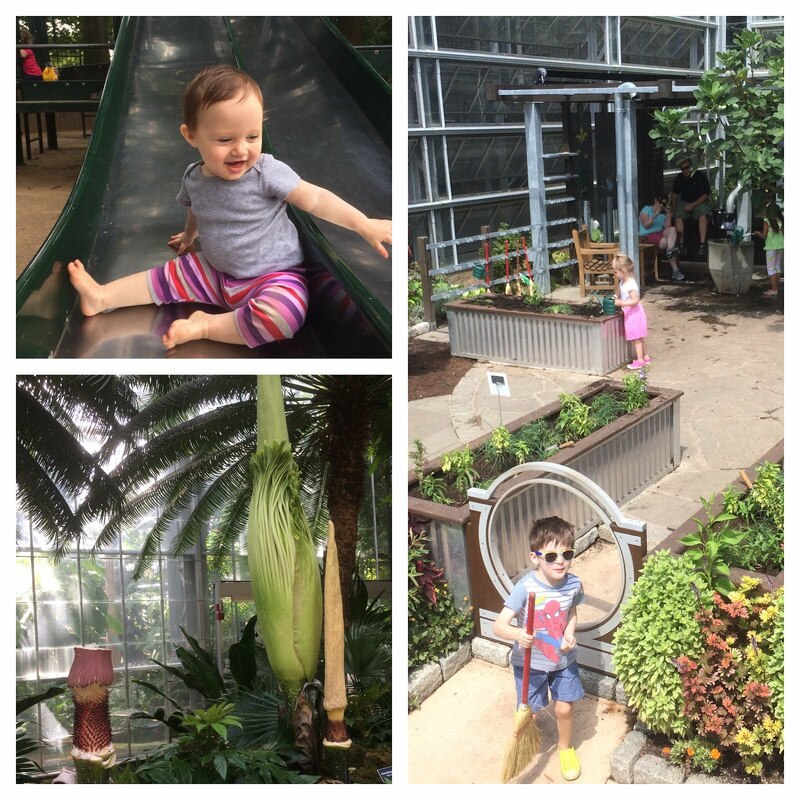 This weekend was beautiful-temps in the low 80s, reasonable levels of humidity-the kind of day you want to be outdoors at all hours to soak it up. 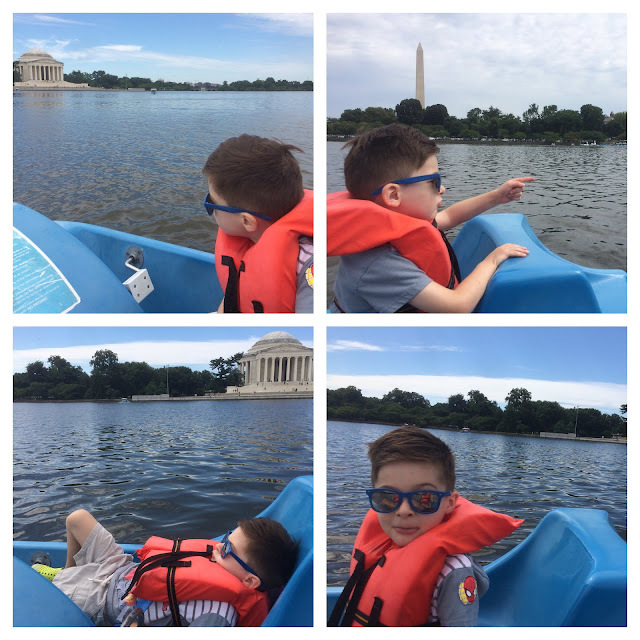 Accordingly, we made our way down to the Tidal Basin so that Henry and I could finally enjoy a spin on the pedal boats. Sadly, our dreams were crushed because the weather was too windy to allow anyone on the water. Womp womp. 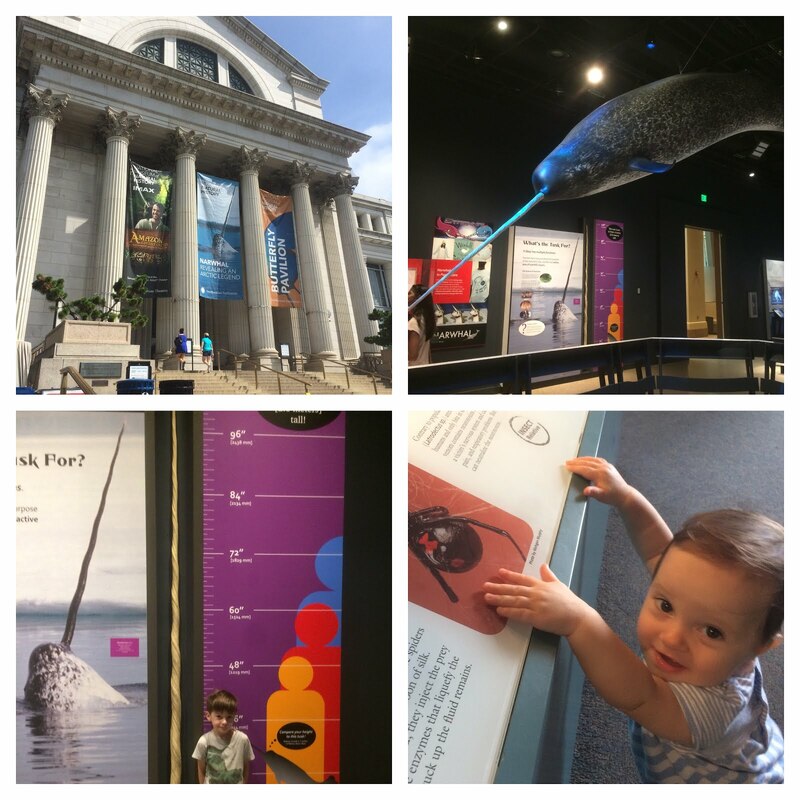 We moved into plan b action, which was a narwhal exhibit at the Natural History Museum (yes, you read that correctly!) however upon arriving, the lines, lines, lines! (Yes, I have some Eric Cartman in me. Also, you bet your bottom dollar we will attempt that again during the week.) 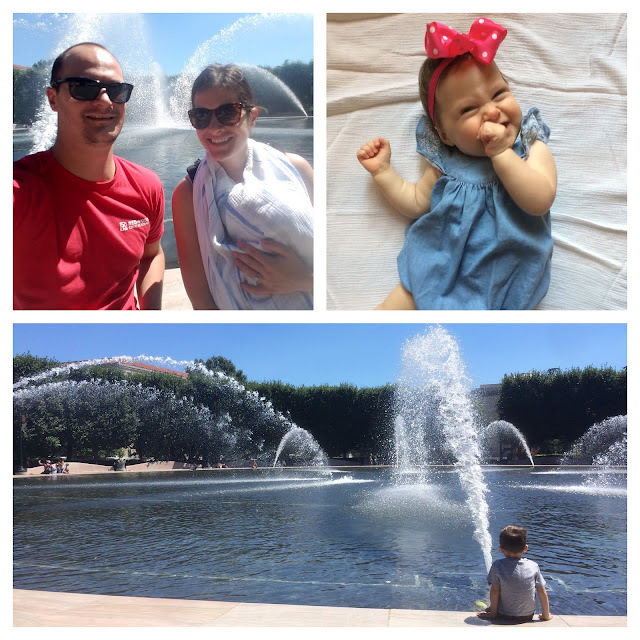 So, onto plan c-we wandered into the National Gallery of Art's Sculpture Pavillion and enjoyed the large pieces of modern art and fountains. We hadn't been before and it was a great way to spend some time outside. Josephine had fallen asleep by the time we reached the garden and fountains, so enjoy her 9 month photo! 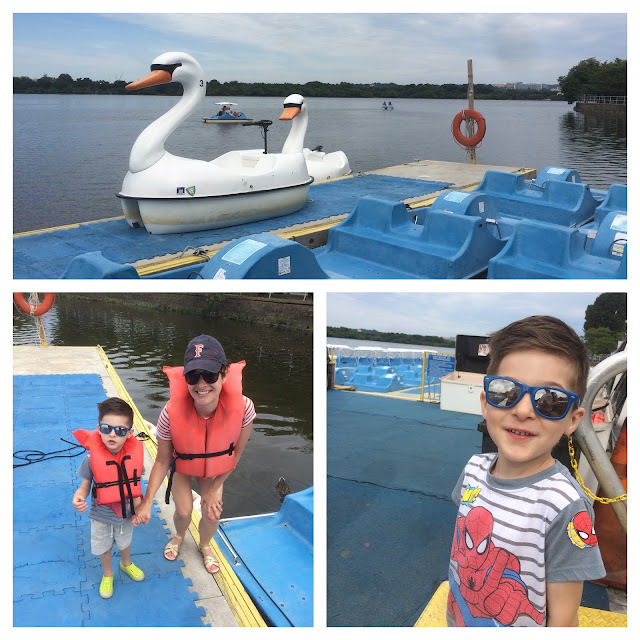 We pedaled throughout the center of the Tidal Basin, which was enough for me because my thighs were burning just getting out of the pedal boat parking lot. 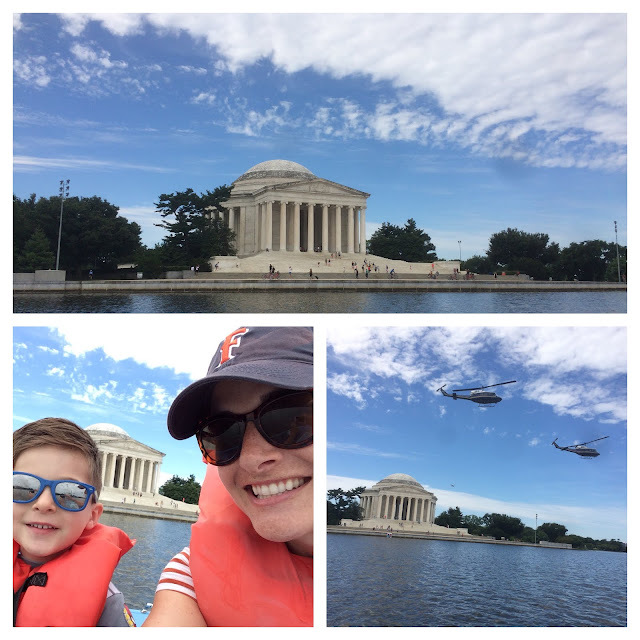 I had hopes of going over towards the MLK Memorial but seeing the Jefferson Memorial and Washington Monument turned out to be just fine. We saw three Marine helicopters fly over and numerous planes taking off from Reagan International. It was a little boy's delight. We've walked the Tidal Basin a handful of times but this was really a memorable way to take in the views and sights on a pretty perfect day with a boy who deserved some focused time. I'm so glad I get to be his mom. 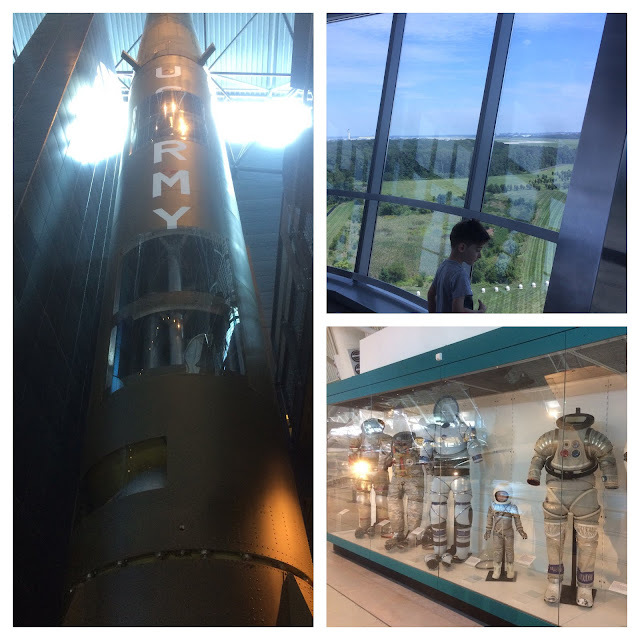 The Museum is huge, as they all are, but this one really felt like an aircraft hanger, and because of the location, there were some school groups and families but the space combined with location made it feel like we had the run of the place. 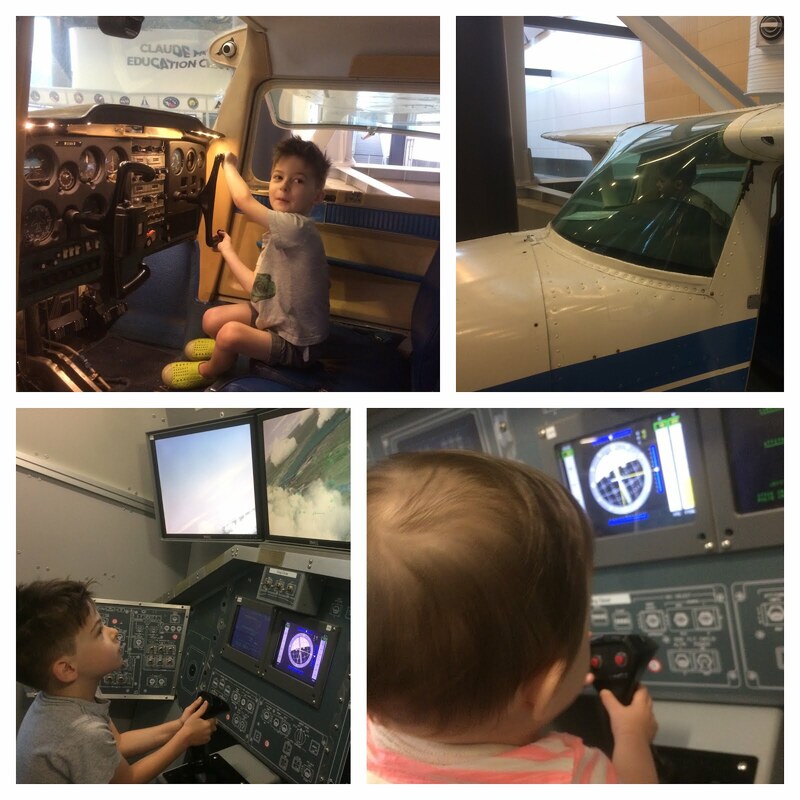 Both kids enjoyed the flight simulator of landing the space shuttle and Henry particularly loved climbing around in and controlling a Cessna. 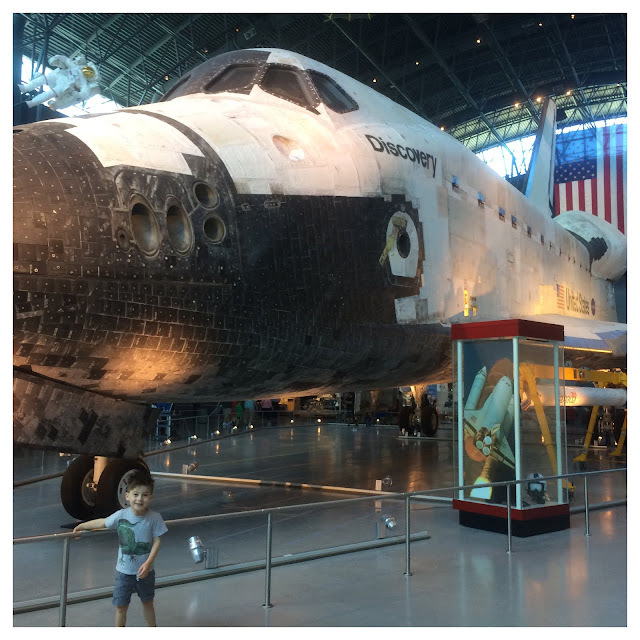 Personally, the space shuttle was the most humbling to see. 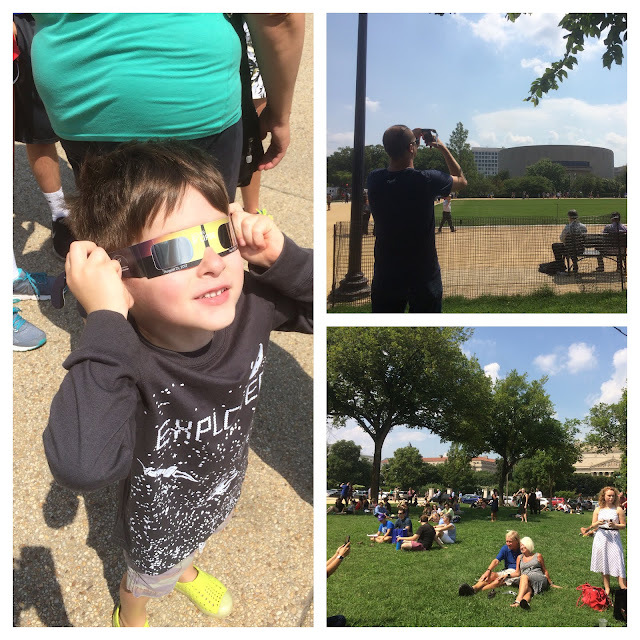 To see something that close that has left our planet and returned was, well, out of this world. 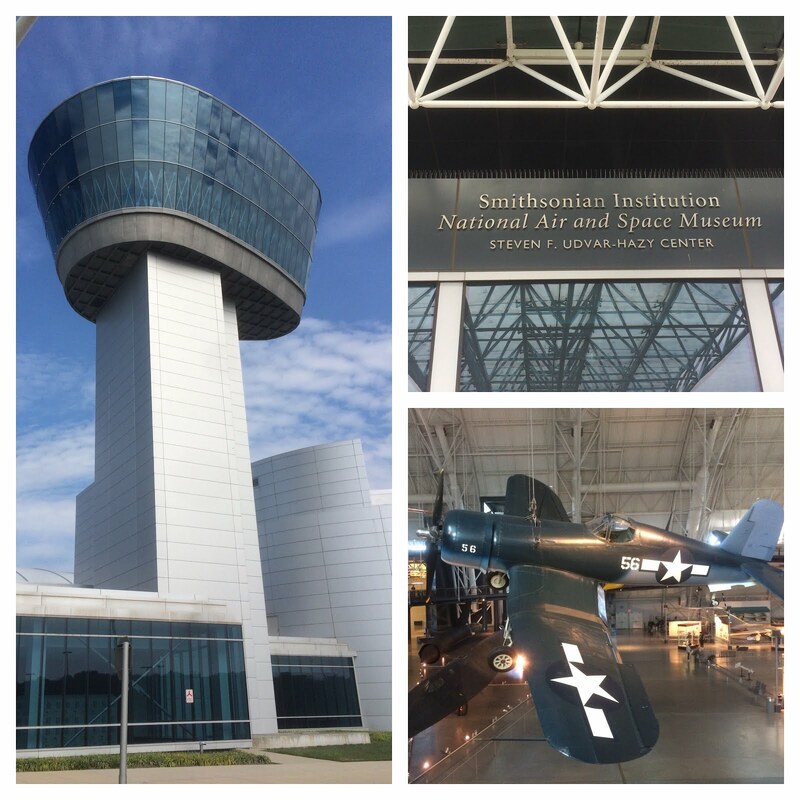 They have a really cool observation deck that let's you watch planes take off and land from Dulles and allegedly, also listen to the Air Control Tower. I guess it was lunch time as we saw zero planes and heard zero chatter, which would have been neat, but c'est la vie. I'd definitely recommend this Air and Space Museum in addition to the one in DC to anyone who may be visiting and has even a remote interest in space or flight-it does not disappoint!